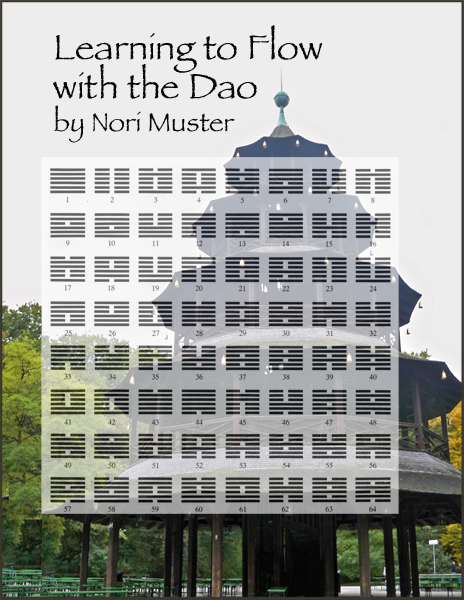 Learning to Flow with the Dao: The 64 Hexagrams of the I Ching by Nori Muster. The I Ching is the ancient Daoist book of metaphors, written to offer guidance in the inevitable changes of life. The I Ching consists of sixty-four hexagrams, the number of combinations mathematically possible with six solid and broken lines. The broken lines "- -" are yin, or passive, dark, yielding. The solid lines are yang, active, light, reaching. Ancient Daoist scholars recorded meanings for each of the sixty-four combinations. Think of your situation, and when you have your questions about it clearly in mind, open the book at random. If you want a traditional reading, throw sticks or coins to choose a hexagram and find it on the chart on the cover of this book. Remember, the hexagrams read bottom to top. The first line is the bottom line, the sixth line is the top line. In all of the hexagrams, at least one of the lines may predict bad results, but that does NOT mean you are destined to get that result. The meaning is that you need to study the action-reaction to see what could go wrong. From there, focus on the positive outcomes in other lines. Study how different attitudes lead to better outcomes.